The actress, who first joined the ABC fairy tale drama in season 1 as Belle of Beauty and the Beast fame, exited OUAT as a series regular alongside five other actors at the close of season 6. However, when EW sat down with executive producers Adam Horowitz, Edward Kitsis, and David H. Goodman to conduct the first edition of The Hot Seat for season 7, the trio confirmed that de Ravin would return in episode 4 to provide an update on Belle. At the close of the season, Belle and the other residents of Storybrooke seemed to get their happy endings. However, in a flash-forward to the future, Henry’s (Andrew J. West) daughter Lucy (Alison Fernandez) said his family needed his help, leaving fans worried about the fates of their favorite characters — especially since many of them would not return in full capacity. That was particularly prevalent with Belle since de Ravin would not be returning full-time, while Robert Carlyle would be continuing as Rumple. Since the announcement, Emilie has filmed her return which features a flashback to her and Rumpelstiltskin’s son’s first birthday. In April Emilie attended two days of Magic Con, I’ve added several images from the event. Enjoy! Back in March, Emilie attended the Once Upon a Time convention in Vancouver. Thanks to Ashley Davis there are really wonderful pictures from it. Be sure to check out her photography as she has lots of goodies for OUAT fans. Last week I finished uploading screencaps and production stills from Emilie’s final season as a regular on Once Upon a Time. Enjoy! A huge thank you to FarFarAwaySite! Hello, everyone! I just wanted to announce that we have brand new themes. A huge thank you to Ana for making our headers and to Neide for customizing our themes! I am saddened for Emilie that Adam Horowitz and Eddy Kitsis decided to write her character off of Once Upon a Time along with many other beloved characters on the show; however, I am very happy that she will get time to spend with Vera and Eric along with freeing her up for new career possibilities. Hopefully, a new show will come along soon and actually utilize Emilie’s talents. What does this mean for the site during Emilie’s possible hiatus? Well, not much until we have more news. I will work on updates. There are still many files I need to transfer from the old gallery to our new one along with some events I need to add and upgrading what I can of our LOST screencaps. I have a few other plans on how to improve this site, but those are going to be hush hush for now. Onto other exciting news! We have a shiny, brand new domain! You can reach the site at emiliederavin.org. I strongly urge you to update your bookmarks to our new domain; however, the site is still accessible through our old one. The Submarine Kid is now available to stream on Netflix US. Sarah Uncategorized Comments Off on The Submarine Kid Now on Netflix US! In October, Emilie participated in ‘Project Fashion Tails’. Thanks to our former co-web, Ana, for telling me about it! Project Fashion Tails is an initiative started to educate the public about the plight of homeless animals through the use of high fashion photography. The situation that homeless and displaced animals face nationwide is startling. Millions of animals through the U.S. are euthanized each year. The goal is to develop a new and unique approach to combating animal abuse and neglect through the use of positive images. With a family background in fashion the Wittels (Howard, Jill, Eva & Harrison) brought together a talented group of celebrities, photographers, makeup artist, hairstylist, digital artist and animal rescue groups to execute their cause. For more information, check out Fashion Tails! Motherhood was a real — and devastating — whirlwind for Once Upon a Time‘s Belle, who after having her pregnancy magically accelerated and then giving birth to a son, tasked the Blue Fairy with taking wee Gideon far, far away, to elude his father Rumplestiltskin’s clutches. Yet from the sound of it, Belle’s little boy is far from out of the woods, as the ABC series serves up its midseason finale this Sunday at 8/7c. Here, Emilie de Ravin weighs in on Belle’s sacrifice, the state of the “Rumbelle” relationship and a “scary” twist to come. TVLINE | I originally aimed to speak to you a couple of weeks ago, but ABC was like, “You may want to wait until after the Nov. 27 episode.” Because a couple of things happened…. TVLINE | What is Belle’s mindset in the immediate wake of making that sacrifice, sending newborn Gideon far, far away, under Blue’s care? Sadness, No. 1. It was amazing to play this episode, being a new mum myself. [The Aussie actress welcomed her first child in March.] All the thoughts that go through your head — your kid is life, you would die for your child in a heartbeat. The stakes were so high, and you have to do what no parent would want to do unless is really is the best thing for the child’s safety, health and happiness, to give them away. Making that decision, as heartbreaking as it was, was the strongest thing she has ever had to do in her life. TVLINE | Which is saying something! Yeah — considering their relationship. TVLINE | You talk about the to-and fro they’ve endured over the years as a couple…. Do you as an actress feel like you have a good grasp right now on what exactly their dynamic is, how exactly he comes up short for her? Is that something you’ve struggled with at times? I did in the past, but this season, for me and for Bobby [Carlyle], they’re both being honest with themselves, for probably the first time. There’s no longer that, “Oh, I’m going to put a facade on to try and make you seem different — or worse for that matter — than you usually are.” The cards are on the table at this point. This is who I am, this is who you are — what are we doing about it? Are we together, are we not? What actually is the reality of this situation? And that’s been really nice and organic to play with. TVLINE | I just feel like some of his words in recent episodes…. These two have become very blunt with each other, so I’m wondering if he has crossed a line, where he has lost Belle forever? Has he said too much? We’ll have to see on that one. I think if everyone looks at their life, you have situations and people and events that sometime define a point where there’s no going back, where that was a turning point. Or, you look back and you think, “Oh, I never really knew that I could get through that, or that that could change. 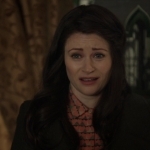 But Belle, right now, is not even actively thinking about their relationship. Her focus is solely on her child and therefore her own health and safety. TVLINE | Her child who at times is played by a grown man. Is that funny for you, playing “mom” to Giles Matthey? Oh, Giles is wonderful — a great actor and a lovely guy. He’s been awesome to work with. But it’s funny, because [Bobby and I] are like, “Oh, that’s what our son would look like!” But we had some tall relatives, apparently. “Grandpa Joe” must have been 6-foot-5! TVLINE | Will Belle have any words with the Evil Queen about speeding up the pregnancy, flirting with her man, or any other bone to pick? We’ll have to see on that one. Remember, at this point Belle is under the impression that she he had nothing to do with [accelerating the pregnancy]. So, that is to be revealed later on. TVLINE | But ideally, you’d probably love to address that at some point. So many wrongs get visited upon Belle, such as when Regina controlled her with her heart without asking permission first…. Oh, as Emilie, I would be over there immediately! 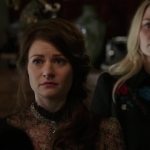 Emilie would be over there like, “What the…? !” [Laughs] There’s a wonderful backstory to Belle and Regina that I hope we get to explore a bit more this season. I love that relationship. The Regina/Evil Queen character has gone through a plethora of things this season, a lot of development there to put it plainly…. Yeah, they’ve gone through a lot in their past. There’s been a lot of redemption there, a lot of hurt, and a lot of reconciliation, too. TVLINE | As we talk about Evil Queen versus Regina, I’m having flashbacks to that Belle’s other personality from seasons ago. What was her name…? Oh, Lacey! Bobby and I were talking about that just the other day. TVLINE | There’s your Season 7, playing dual roles! I admire Lana [Parrilla] doing this, but my god it’s a lot of work! [Laughs] Lacey was fun, though, let’s bring her back for an episode. I’d be down with that! TVLINE | What else can you say about the larger twist in the midseason finale. Something about an alternate reality…? Oh, we’re always dealing with alternate realities, aren’t we? TVLINE | There are stills of Jen, Ginny and Josh in their regal finery, on a green stage…. I kinda don’t want to say anything about that, because that’s more fun to see play out. They look amazing, though, and it is pretty cool when you find out what that is about. Look, there are two really big twists that come in very shapes and forms — one of them will have people very excited and happy about, and the other, people will be scared and confused by.